Hot behind their crucial repress of Freddie McKay’s ‘Tribal Inna Yard’ LP France’s Iroko Records have announced a 12” taster for another intriguing album release. 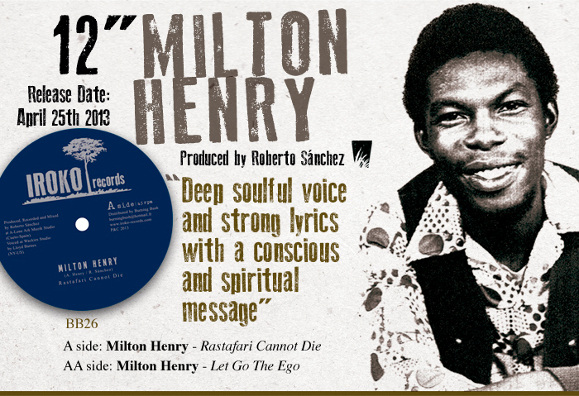 This time it is not a reissue but a new collaboration between Northern Spain’s retro roots master Roberto Sanchez and Greenwich Farm reggae scene veteran Milton Henry. All three tracks were voiced by Henry at the legendary Bullwackies studio in Brooklyn for Lloyd Bullwackie Barns, over rhythms laid by Sanchez’ Lone Ark Riddim Force in Santander.